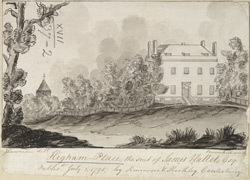 Drawing of Higham Place, the seat of James Hallett Esq. It was situated near to the Barnham Downs where every August Canterbury horse races were held. The house itself is a rather plain Georgian block mansion, 5 blocks wide. This drawing is copied from an engraving by Ravenhill which was published by Simmons & Kirkby of Canterbury on June 1 1795.